You get home, haven't even begun to think about dinner and have about 15 minutes before your kids start melting down. Wait, isn't that every night?! I hope you add this two cheese pesto pizza to your rotation. It's crazy easy to make and, as you can see from the picture above, it's served with love. 2. Place the first 2 ingredients in a bowl and combine. 3. 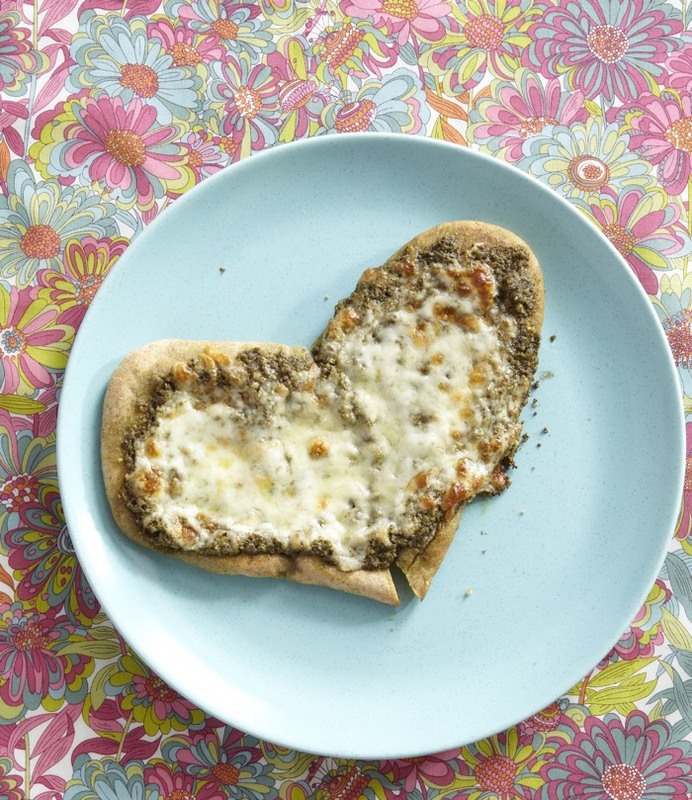 Spread 1 tbsp of pesto on each piece of naan bread and top with ¼ cup of the cheese blend. 4. Place pizzas on a baking sheet and bake for 10-12 minutes. Naan is a type of flatbread that is, thankfully, becoming more and more popular. You can find it at Trader Joe's, Whole Foods, and even your local grocery probably will have it! You can also find it in different flavors. Yum! I do this all the time with homemade marinara and either pita bread or tortillas... so everyone has their own personal pizza! Will have to try naan. My son saw this and said \"Mommy this is our lunch today but not in a heart shape because thats for a girl\"
Can not wait for lunch now! Mmmm, I love pesto on my pizza!! Was this your recipe in Parents? Can't remember when that was --- but I have been addicted to it ever since!!! Never had Naan before, but this (my) favorite -- the kids ate it for the first time last night (they are super picky lately....finally willing to try the Naan, but still won't touch anything green or tomato-y) ......it so good with the pesto!! Yes, this is the recipe I had in Parents! I'm glad you like it! Used garlic naan from T.J.'s. So easy &amp; yummy. My husband (who can barely microwave food) made these for him and our 2 year old while I went to the movies the other night. They were a hit. Catherine, you are the BEST! This recipe is awesome. Super easy and delicious! Thank you so much for making my life easier with your simple, healthy and delicious recipes! !